-Fix for color printing issues. -Fix for iOS 10 printing. – Fix for OSX 10.7.x systems not being able to run v5.0.9. – Fix for a bug introduced with the support for cloned printers. 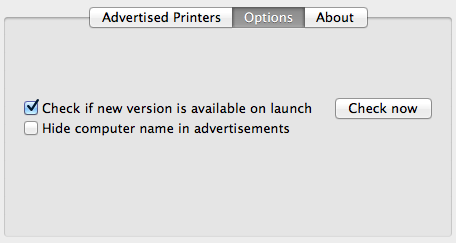 Printers would not be properly removed after being removed or renamed. – New feature to allow the “cloning” of physical printer. This allow for the creation of “Landscape” or any other configuration combination needed to print the way you want. -Fixing possible issue on printer configuration changes. 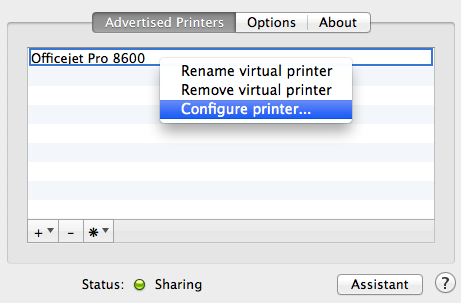 – Fix for printer names with “@” characters not displaying and sharing correctly. – Fix for UI not responding on Application load. – Fix for printer configuration changes not taking effect after changing and saving them. – Change default option to Static TCP port due to bug currently in OS X 10.9. – Added an alert if an old v4 license is entered in the license fields. This should help clarify confusion with v4 licenses in v5. – Fix for Printer Configuration Scaling and Orientation not being applied. Will also resolve borderless printing showing with white borders. – Changed the way the application use TCP port. It will now pick a random open port instead of a fixed 9631 TCP port. – Moved version from Beta to Final as it is very stable. Many thank’s to all that provided feedback and helped us make it where we are now. 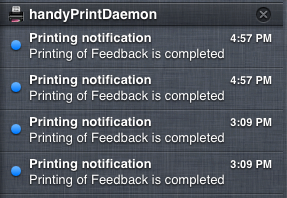 – Fix problem with disabled printers still showing as shared after turning handyPrint OFF and ON. – Various code optimisation and cleanup. – Fresh compile under xCode 4.6.1. 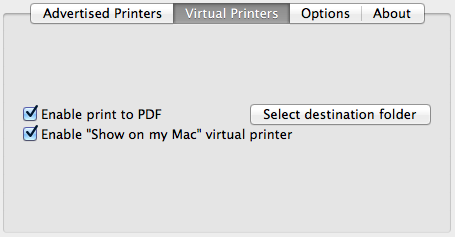 – implemented new buttons to add and manage virtualprinters. The old ones where missed by most users. We hope the new design will be easier. – New “Trial” tab under license. – Fix bug causing PrefPane hang when trying to save printer configuration. Oups! 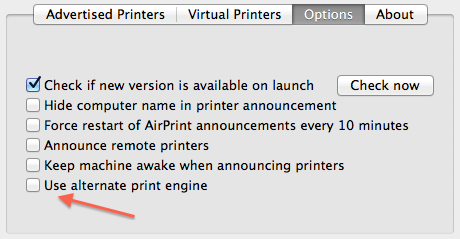 – Fixing above will cause a temporary bug for non duplex printers. Make sure to select to not print in Duplex on your iOS device when printing as a work around. We will fix in the next beta release. – New license code validation process. – Fix for bug when renaming printer queue. Would cause orphan printers. – New license verification with license server. Should help with rampant piracy of the application. – Other minor bug fix and code cleanup. – Fix for iOS reporting printer offline after changing printer config under a3… I hope. Work around if this happen is to flick the switch to OFF and ON. – Relabelled a22 to b1. 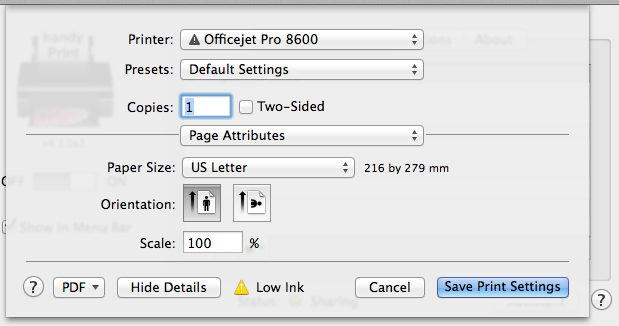 – Added a new option to print two pages per page under Options. This is a great way to save paper. – Minor GUI fixes. Moved Media selection from Virtual Printer to Options. – Another attempt to fix a bug that cause the Daemon to crash when printing web pages. One very patient user was able to validate that this version did the trick for him. We hope it will for everyone! – Fix for random handyPrintDaemon crash (we hope). – Added option to keep Printer Default media type to Media type drop down list. – Added debug code so crash report will give us more information. – Code improvement and bug fixes. – Changes to engine to fix crash on certain print. Still not 100% there. – Rebranded application to handyPrint. – Improved installer to handle closing of PrefPane.